Mostly, we talk about games with strategy here. Games where you think before you act. Games where you make decisions. But sometimes, even here in the Meeple Cave, we just want to throw down and fight. And we don’t do anything by half, if we throw down, then it better be a Maximum Throwdown. Now, I’m not being entirely serious when I imply that you don’t make any decision in this game. You don’t make many, but you do make some, chief among them where you throw your cards. Yeah, you heard that right, you’re going to throw your cards, Maximum Throwdown is a dexterity game. Now, just go ahead and take a regular, good quality playing card and try to toss it on a target. Did you hit it? If yes, then you’re off to a way better start than me, because I started playing what was basically a game of luck. But I did improve my aim quickly. And that was sorely necessary because, at the start of the game, where you throw your card is the only decision you make. If it doesn’t land in that general area, that’s too bad. A game of Maximum Throwdown starts with a number of neutral cards on the table, and any card tossed has to touch one of those or a previously tossed card. Cards that don’t touch any other are removed from the table and lost. That’s the first challenge to your aim, you have to actually hit another card. But it gets worse: each card shows a number of icons, and at the start of a player’s turn, each visible icon in his color gives him some sort of benefit. So you really, really want to cover up the icons that would benefit your opponents the most – a much smaller target. It’s not quite as bad as it sounds, though: if only a small corner of an icon is covered, it counts as covered. That’s still almost as bad as it sounds. 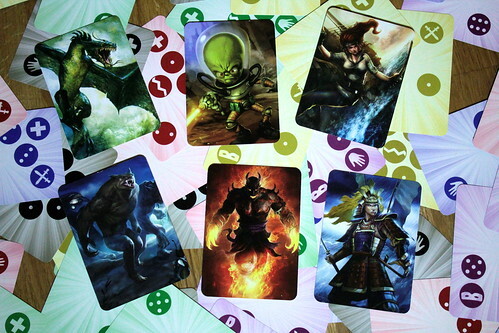 Each faction – because Maximum Throwdown is a huge free-for-all battle of Demons vs. Samurai vs. Dragons vs. Pirates vs. Aliens vs Werewolves – has a different strength, represented in the icons on their cards. But it’s only a question of emphasis, all factions have access to all icons. So, when your next turn starts and by some miraculous turn of events – or simply because your opponents’ aim is as bad as mine – some of your icons are still showing, here’s what you can get for them. Draw: you draw an extra card at the start of your turn. With none of these showing, you only draw one card, so you really have no choice which card to throw. 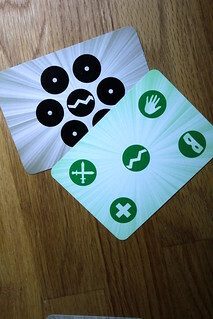 Having a draw symbol doubles the number of decisions you make on your turn! Break: this is the icon that made me have more than two cards in the game at all the first few times I played. For every Break, you may leave one card on the table that is not touching any others. Even after you stop being awful, these icons still have a huge benefit as they let you place your most valuable cards away from the big battle, where your opponents take a much greater risk to miss their throw, should they aim for that card. Steal: this is where the evil starts. For each steal, you may draw a card from an opponents deck and immediately throw it. The rules specifically allow you to throw it face down, so the owner doesn’t get any of its benefits. And if you manage to cover enemy cards, then you can piss off multiple people with one throw. There’s nothing to dislike here! Attack: Steal’s slightly more boring little brother, it lets you take a card from an opponent and discard it instead of throwing it. You can’t cover anything, but the card’s owner will be just as angry. Points: finally, a way to win the game! The Points icons show one face of a die, and for every six pips your dice are showing you score one point. Those pips may come in one icon of six, six icons of one or anything in between. And they score again every turn as long as they are visible, so these icons are a good candidate to aim for. And now you just take turns doing that until the last person runs out of cards. That last bit is important, if you run out of cards first that just means you watch every else toss more cards every round and completely burying you. The Throw icon is not always your friend. Anyway, after 30 minutes of swearing at your own misses and everyone else’s not-misses, the game is over. While it’s not devoid of strategy – you do decide which card to throw, who to steal from, what to try and cover up – you didn’t do much thinking in that time. But, unlike other games with little thinking, Maximum Throwdown is actually fun. Not to fill an evening, but between two other games, some Throwdown is great. You can still enjoy yourself, cool down your brain, actually get up from the table and move around a bit. And with some practice, it almost doesn’t count as a game of luck any more.